The fourth annual Daiwa Pole Fishing Masters took place between the 11th and 13th June at the prolific Tunnel Barn Farm Fishery near Warwick. The event attracts one of the strongest fields in UK match angling including England, Welsh and Scottish Internationals, Match This Champions, Parkdean Masters winners and UK Champions being amongst the line up on this years event, making it one of the most coveted titles in modern match fishing today. The contest sees each angler fish three different pools across three different days in an effort to score the least amuount of points in their fourteen (14) or fifteen (15) peg section. The overall winner of the festival is the angler with the lowest cumulative points score over the three days of the event. In the event of a tie, the angler with the most section wins comes out on top. If there is a tie on section wins, the angler with the highest cumulative weight over the three days of the competition takes the verdict. 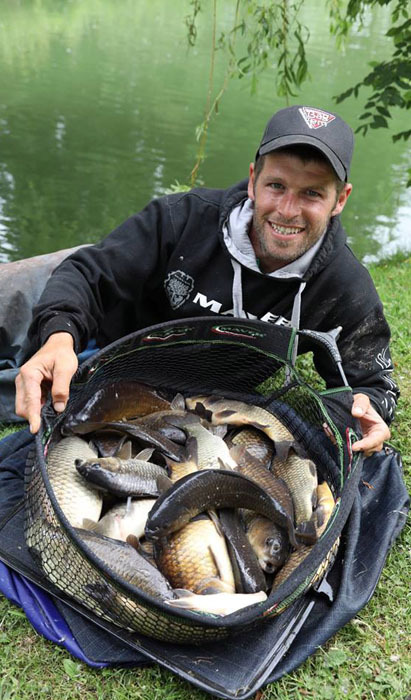 Below, Dale Shepherd reflects on this year’s festival which saw him secure an overall top place finish in arguably one of the toughest festivals of the year taking into account how prolific the venue is and the calibre of angler the event attracts. Dale Shepherd put on a fine display of F1 fishing during the third and final day to secure an overall win. “The opening day of the competition saw me draw peg 41 on New pool. My section was split with a section on High pool. I started the match on pellets down my edge, but it was slow to pickup, so I switched to maggots down the middle to depth and enjoyed a nice run until they decided they’d had enough. For the final part of the match, I fished across on dead maggots and Bag ’em XP dark to end the match with 95lb, which was good enough for third in my section. Another 5lb would have seen me win the section! Oh well, looking back perhaps I should have fished the same method across down my edge…“. “The second day of this year’s festival saw me stationed on peg 6 on Jenny’s. I didn’t really know what to make of my draw, but with the wind blowing away from me, it didn’t exactly fill me with confidence! Like the previous day, I decided to start in the edge with pellets and had a good start with seven (7) fish in first thirty five (35) minutes. I then had a look on maggot down the middle as the fish were defintely there, but couldn’t get a bite. I then decided to fish shallow and had another good run before they were gone again. During the final throws of the match, I had to watch the lad on peg 4 catch me up. I thought he’d beat me with his last two (2) fish. As it turned out, he’d beat me by 1lb so 2nd place had to do“. “The final day of the festival saw me draw a flier in peg 9 on House pool – happy days! However, upon arriving at my peg the wind had changed with it now blowing the other way. I adopted the same approach as the previous two days starting on pellets down my edge. I had a steady start before decided to fish shallow but the fishing was a little patchy with lengthy periods of bites being difficult to come by. It was a case of a few fish coming shallow, then I’d have to switch back to my edge line to catch one or two before going back on to my shallow line, and so on. I ended the match with 171lb for a section and match win. A great way to end the festival“! “As a bonus, I managed to win the pairs with Micky Rodgerson! Overall, I finished with six (6) points, which was good enough for a 4th place finish. I had a nice three days – roll on next year“!